I keep receiving them from random people, almost like spam, but I don’t think anybody is actually sending them to me! When I go to google drive of course I can’t see any. Anyone else got this really weird issue? I’ll try to remembering to post a few screenshots next time. You may be into something, but I’m not accessing any files online. Just double checked. Shared with me contains only files from people I know (known emails) as I’ve checked it before. My Drive (actually I went to Recent), however, does contain the files I was getting on inSync, from unknown places. This means I’ll contact google drive support now! Really weird stuff such as this “input” or that “roster”. Maybe they are spam anyway… Spammers are always trying new tools and ways. Hi @cregox can you kindly let me know your OS? What is Incoming shares? I keep getting some notification from god knows who!!! I don’t want to share anything from ym drive to anyone nor I don’t want to receive any shares back!!! I had the same problem and although all seems to be against insync @jaduenas is right. From what I understand, when insync starts for the first time, it goes through Gdrive’s event history. Please devs correct me if I’m wrong here. The files mentioned in the incoming shares sections include any file that was shared online to you (using links to someone else’s drive content). As a result within all the good stuff, we also get links to past spam files or other random content available in public on Gdrive that we interacted with too and that’s where things start to get messed up. Sure this is a huge design flaw on insync’s side but the client is not in any way related to the content that shows up on incoming shares even if initially everything looks against it. Same problem here. Would really like to see this solved. There’s one particular person who shares dozens of files with me every day, but they don’t show up in Drive’s “Shared With Me” section, so I can’t turn them off. Something is wrong on Insync’s end. Came here with the same “issue”. I get what appear to be random share notifications. The shares do appear in “Recents” in Drive. I was wrong, the “random” shares are not in recents. Thanks all! I’m in a similar situation. I think that Google tracks my browsing activity whenever I’m logged in to G+. (That is: almost always!) Anything Google-based I view is noted. That might be viewing a GDOC that someone’s shared from Google Drive (GD) — or embedded in their web page— or a photo that someone posted on their G+ album, or a Google forum entry, or … who knows? Google records the specific item, and, to some extent, the context. If I happen to view a single JPG of a shiny motorcycle, Google will know and remember the album that contained that JPG. This may occur on a web page without any obvious sign of a connection to Google. I’m guessing that this data-gathering is on-going and the records are more or less permanent. (Why? Some of the items I note below are several years old.) Much of the data may be unused until Google figures out how something useful to do with it. dialog. Large numbers of these. So many, in fact, I don’t even try to use Selective Sync. I also think Insync, can see the origin (or “type”) of each item. Why? Because, as far as I can see, Insync currently does an excellent job at syncing only the items that a user can see on his/her GD through the browser interface. So, for me: no more “random shares” are downloaded. “Shared With Me” folder/file tree in Selective Sync, limiting the display to only files and folders that are visible to the user through drive.google.com, and —for those of us who have many such extraneous items, making Selective Synch usable. UPDATE: I spoke too soon, or something changed since I posted several days ago. Today, I found over 750 files, almost 1GB (!) of unwanted Shiny Motorcycle (and similar) JPGs in my local Insync Folder. These do not show up in Drive Web View. I moved them out of my local Insync Folder, and --for the moment-- Insync seems to be signaling “all sync’d” – it hasn’t replaced those files, as I would expect. I’ll be watching. To repeat my earlier comment it just isn’t practical to uncheck all 750 files, individually, in Selective Sync. UPDATE 2: Several days later, Insync has not refreshed the ~1GB of Shiny Motorcycle images in my local Insync Folder. Good! The way I understand this technology, this files should have reappeared after I removed them, unless the owner removed the original files or somehow disabled sharing with me. That seems very unlikely, as many months ago I discussed this issue with him and he clearly doesn’t know how to do either. My question, too. I submitted my logs as requested, several weeks ago, but no response. I think it is pretty clear that the Drive API does differentiate between these and “true shares” based on the fact that the visibility of these types is different. Files of the “drive-by share” type did show up for a while in drive.google.com directories – but that was many months ago. Also: my overseas colleague regularly deposits files in a folder she explicitly shared with me, and they reliably turn up within a few minutes in insync’s local folder on my machine. Not in the “Shared with Me” listing. (As I’ve commented, the “Shared with Me” listing is so long now, I can’t easily do a decent survey of it, so there’s some uncertainty.) So, yeah, different visibility for the two different share types in insync currently. By the way, the “Shiny Motorcycle JPGs” I deleted did eventually reappear in my “Shared with Me”. Just took a while – many days. My impression: possibly “drive-by shares” are sync’d at a lower priority. In my experience, I expect a 1GB group of “true shares” to sync in a small number of hours. Would it be worthwhile gathering some specific comparative data on this point? Having the same problem, random files appearing in the incoming share section. An option to ignore these would be great. I can provide logs if necessary. Thank you for the suggestion Henry. Yes, right now, the only workaround is to use Insync’s selective sync to uncheck and unsync the Shared with Me files that you don’t want. You may also use Finder if that’s easier – right-click and select “Selectively unsync”. However this only currently works for individual files (and not multi-select). But for future such files, they won’t sync automatically, and you can filter them in Insync’s Incoming Shares section (and choose not to sync them). I guess this offers hope of a fix in an upcoming new version. The workaround offered isn’t very effective when there are hundreds of unwanted (“drive-by”) files displayed. To be very clear: at the moment, at least, the unwanted shares are not visible in my local folder, nor in the “shared with me” folder in drive.google.com. I see them only in Insync’s “manage–>shared with me” panel. Which is good, except that it is very difficult to use this panel when it’s clogged with hundreds of unwanted files. In all fairness: I’m guessing this is an issue with Google Drive’s API, through which Insync accesses a list of files shared to “me” by others. Maybe it is difficult or impossible to distinguish between files shared by friends/associates --which I want-- and those files that Google has inferred I have an interest in, often incorrectly. So we’re waiting for Google to make a relevant improvement. We’re discussing the phenomenon of “drive-by shares” – poetically named this by an earlier poster to describe files or folders that, apparently, Google has decided we’re interested in, perhaps because we accessed these items one time, possibly by accident. So Drive makes insync aware of changes to these files. And there’s seemingly no way of stopping this. Up to now the problem for me has been extraneous files in insync’s Shared with Me display, hundreds of them – so many that this display and its associated controls are essentially useless. But today a new wrinkle: I noticed my insync Activity feed is swamped by a series of changes made to a set of documents in which Google has decided I have an interest. This feed shows only the 50 most recent items, and all 48 of them describe changes to such “drive-by shares” from one source. The remaining 2 show changes made to an additional 2 “drive-by shares” from two different sources. In other words, some person I don’t know, doing a lot of updates to files I don’t care about, has preventing me from seeing change notifications from a colleague with whom I’m actively working. Another reason that it is important to get these “drive-by shares” under control. It would seem from this discussion it’s only Google’s responsibility. I don’t buy it at all. The ultimate responsibility is Insync’s. 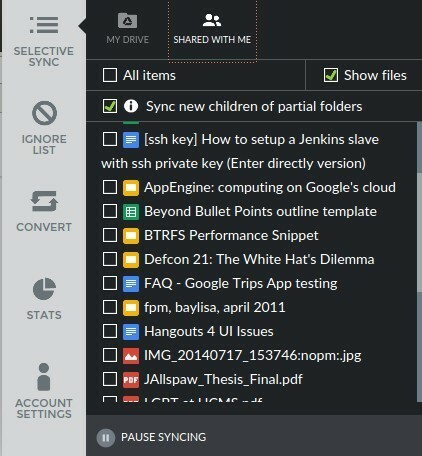 I don’t want ANY shared items, as I don’t use Insync to share but to sync my files across devices. So I should be allowed to turn off all sharing. As simple as that. But they clearly don’t want to do it. Why don’t I get any “shared items” in my Google Drive app? This problem starts and ends with Insync. The good news for me: the “drive-by” shares --shiny motorcycle images-- have disappeared, many hundreds of them, hopefully forever. Something has changed for the better. Maybe Insync did it, maybe Google, who knows? My guess: Google’s API for Drive was somewhat experimental for a long time. Insync chose to interpret the standard to get the most information from the API, at the risk of giving some users too much data. At some point at the last year, the Google’s design became more solid, and Insync could do a better job choosing what data to provide to users. If you have unwanted shares from others maybe you can delete them now and they won’t reappear. I hope so. If your problem is fixed, then there is no need to determine responsibility. Anyway, bitter words toward anyone usually has no positive effect.